Archbishop Giuseppe Siri is here being raised to the Cardinalate. 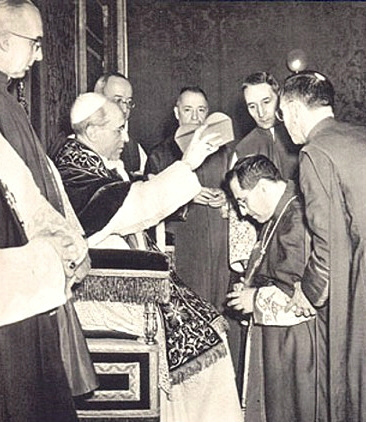 He was the last Cardinal created by Pope Pius XII, and the youngest. In the gospel of Matthew (16,18) the “Rock” is Peter, who is not only a person, but an “institution”. The Church, founded by Christ upon that “Rock” –Peter--, clearly appears (in the cited text) to aquire solidity, stability, and indefectibility. The link between the consistency of the “Rock” – Peter—and the consistency of the Church seem so indisputable that unwarranted inference is not made, qualifying the same Church as the “Rock”. Here we talk about this “Rock” that Christ wanted. That being said, there are some important considerations. The Church gives security because it is the “Rock”, not an agglomeration, not built on sand. The meaning of the word “rock” is a signification,which goes beyond even the usual sense of metaphor: in fact, the rocks of the earth get cracks as time goes on, by the actions of weathering. This “Rock” has neither cracks nor crumbling, given that the effect of Its solidity is guaranteed in the text of Matthew as being until the end of Time. The Rock remains and no one can scratch it. But sometimes men can remove the vision of the Rock away from others. Another thing can [appear] to be the Rock, another thing which looks to be such to everyone. The distinction is profound, even when human errors can veil the Reality, while they cannot destroy It. In short, and easy for all, the question of the “visibility” of the Rock is put forward. The consequences would be grave if it happened that some men removed the visibility of the “Rock” in the Church. He who converts to the Church, converts because he is convinced that he has found the “Rock”, not doubt, excitement, contradiction, [or] doctrinal anarchy. He converts when he knows that he rests on the safe side, on the durable, on the indisputable. He converts when he knows that his hope is not inane. Take away the visibility of the Rock: what will this man do? It is necessary that the “Rock” stay visible in Its compactness and invulnerability. The word “rock” indicates a grave and certain reality, which comes to be expressed with a strong metaphorical significance. Perhaps it is not bad to leave the metaphor for a moment. Here are the elements by which the Church, with full and pure significance, can be called the “Rock”. She has as her Head, and the Divine Guarantee of, Jesus Christ. He has assigned Her with four distinctive marks which are mentioned in the Constantinopolitan Nicene Symbol. She has the legitimate and secure sacramental efficacy. [Notice that the Church and the Papacy are inseparable. –Editor]. She has the entire Truth, guarded with warranty. She has, therefore, the impelling and pacifying distinction between Truth acquired with certainty, and hypotheses, opinions, the always free research. She has it all because in Her functions an infallible Magisterium. Infallible Teaching [the Magisterium] is bound to the hierarchical structure of the Church. This is why he who does not see the Hierarchy, does not see the “Rock”. Once lost, security is not easily acquired. 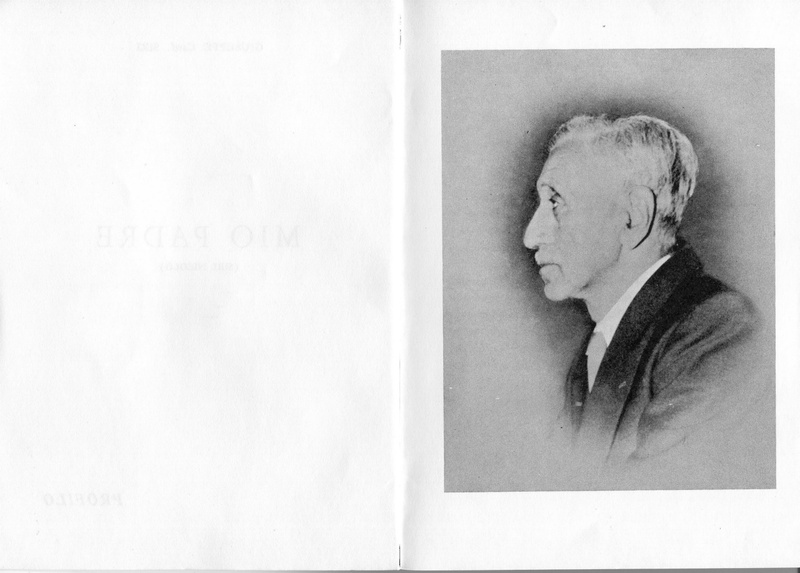 [Published in Renovatio: rivista di teologia e cultura, April-June 1967, Year II, Number 2, Genova]. The small book titled "My Father" was written for family and close friends, some years after his father's death, and, interestingly, after the last of the Cardinals who were truly Catholic died. The English translation is made available here. The other languages, including the re-typing of the original Italian, will follow as soon as possible. On a trip to Spain. 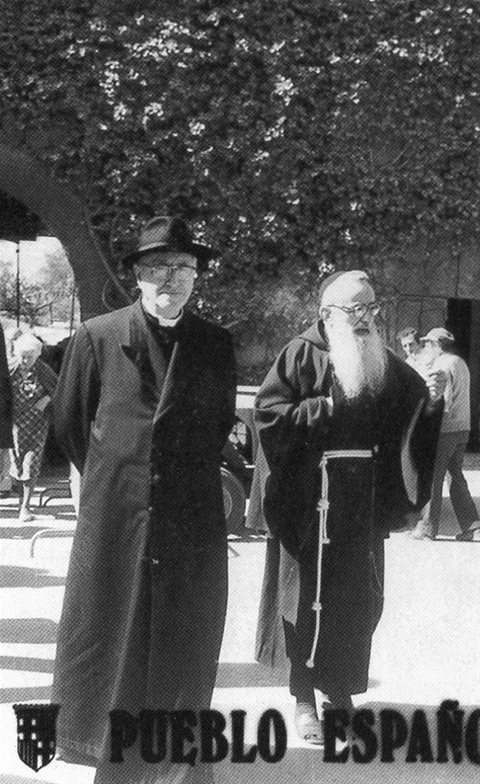 The Hidden Pope is with his confessor, Fr. Damasso, ofm cap. (The New Montinian Church, Saenz y Arriaga, Fr. Joaquin, translated and published by Edgar A. Luicidi, M. D., 1985, p. 350). 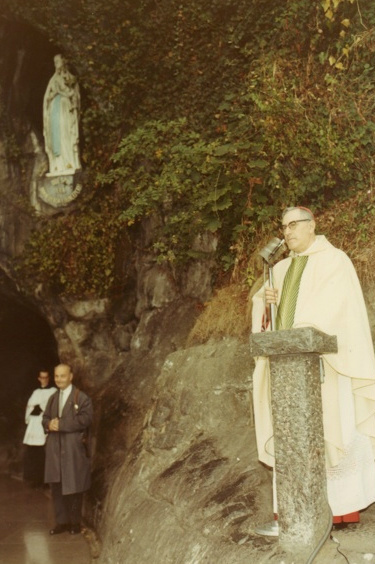 Pope Gregory XVII at the Lourdes Grotto in the 1970's.